1099s are information returns that businesses are required to prepare, to report various payments made in the course of their trade or business to individuals and/or other businesses. Companies can be penalized for failure to comply with the 1099 filing requirements. These penalties have increased significantly over the last few years. For more information on the increase in information return penalties, visit https://www.irs.gov/government-entities/federal-state-local-governments/increase-in-information-return-penalties-2. Who needs to complete a 1099-MISC form? Filing a 1099-MISC form is required to report payments made for royalties of $10 or more and payments totaling $600 or more for rents, services, prizes and awards, other income payments, medical and health care payments, fishing boat proceeds, gross proceeds paid to an attorney, and to report any payments from which backup withholding was withheld. 1099-MISC forms should not be given to an employee unless the employee is, in fact, self-employed and providing a service that is completely unrelated to the work they perform as an employee. Typically, independent contractors offer their services to the public. The person for whom the services are being performed has the right to control or direct only the result of the work, but not the means or methods used to accomplish the work. The consequences of treating someone as an independent contractor, when they are an employee, are that businesses may be held liable for the employment taxes of the worker and any benefits they would have been eligible to receive. Publication 15-A lists several industry examples to help clarify if a worker is an independent contractor or an employee. 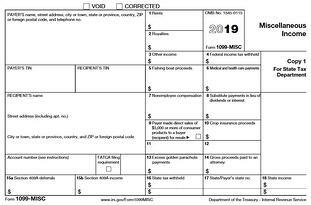 1099-MISC forms are not required for payments made to a corporation unless the corporation is a physician, a provider of medical or health care services, or an attorney. Step 1: Collect the following information for each contractor. A TIN will be either their Social Security number or federal identification number. Mail them a W-9 form to request the number and identify the type of entity. A W-9 form provides proof that the identification number being used is the number they gave you, in the event, you receive a notice from the IRS of a discrepancy and a request for back up withholding. If a recipient does not provide a TIN, leave the TIN box blank on the 1099 and file it anyway. Keep on file any correspondence proving you tried to obtain the TIN. Backup withholding of 24% is required on payments made to persons without a TIN or refusing to give a TIN, or on payments made following receipt of an IRS notice requiring backup withholding. If there is backup withholding from a payment, the regular filing limits for 1099s do not apply. In other words, a 1099 must be prepared regardless of the amount of the payment made to them. For example, a 1099-MISC form for lawn service does not need to be filed for amounts paid totaling less than $600; however, if there was backup withholding, a 1099-MISC would be filed for all amounts, including those under $600. The entire amount you paid the contractor during the year. Step 2: Complete the 1099-MISC form. a. Complete the PAYER’s name, street address, city or town, state or province, country, ZIP or foreign postal code, and telephone section with your company’s information. b. In the PAYER’s TIN box, enter your company’s TIN. c. In the RECIPIENT’s TIN box, enter the contractor’s TIN. For sole proprietors, including single-member LLCs, use their Social Security number or Employer Identification Number; Note - the IRS prefers the Social Security number. d. Complete the RECIPIENT’s name, street address (including apt. no. ), city or town, state or province, country, ZIP or foreign postal code section with the contractor’s information. Note for sole proprietors, including single-member LLCs, show the individual’s name on the first line and the “doing business as” name on the second line. You may not enter only the business name. If you are using a Social Security number for reporting, you should not enter the business name, only the individual’s name, or it’s very likely you will receive a backup withholding notice. If payments were issued in more than one person’s name, only the name that corresponds to the TIN should be shown on the name line. Show other names of recipients or business names in the space below the first line if desired, before the address. e. In box 1, report any rents paid. Include amounts for office rental, equipment rental, or pasture rental. Do not include amounts paid directly to a real estate agent. f. In box 2, report royalties paid of $10 or more. g. In Box 3, report other unearned income not subject to self-employment tax. Include things like punitive damages and prizes and awards paid to non-employees that were not for services performed. Any payments made to deceased employees must be reported in Box 3. If an employee dies during the year, payments for wages, vacation, and other compensation (excluding pension distributions) made after the date of death but in the year of death are considered earnings subject to social security and Medicare withholding. These payments are not considered employee wages for federal purposes. The amount paid after the date of death, but in the year of death, is reported on a 1099-MISC in Box 3. The employee may receive a W-2 and a 1099 in the year of death. Payments made outside of the year of death to the beneficiary or estate must be reported on a 1099-MISC in Box 3. The 1099 should be prepared using the name and identification number of the person receiving the payment, not the deceased employee’s name, as these payments are not considered wages and no W-2 filing is required. h. Use Box 4 to indicate any federal income tax/backup withholding. i. If the business pays anyone for fishing boat proceeds, you will need to review the instructions for Box 5, for additional information see https://www.irs.gov/pub/irs-pdf/i1099msc.pdf. k. Box 7 is for reporting non-employee compensation; compensation paid for services performed for a business by someone who is not an employee of the company. Generally, amounts reported in Box 7 are subject to self-employment tax. Report payments of $600 or more that were made to persons for services, not for products or merchandise. These could include payments made for such items as accounting fees, director’s fees, cleaning services, lawn maintenance or auto repairs, or for prizes and awards for services performed as a nonemployee. These amounts can also include payments for parts and materials as long as supplying the parts and materials was incidental to the service performed. An example of this would be a painter who provided his own paint or a cleaning service that supplied their own cleaning products. Payments made to attorneys, whether or not incorporated, of $600 or more are required to be reported in Box 7. Additionally, if a settlement payment was made to an attorney and the attorney’s fee cannot be determined, the total gross proceeds paid to the attorney must be reported in Box 14 and not Box 7 (even if the total is less than $600). l. Review the instructions and complete Boxes 8 through 14 if they apply. For additional information, see https://www.irs.gov/pub/irs-pdf/i1099msc.pdf. m. Use Boxes 15a and 15b to report total deferrals during the year of at least $600 for non-employees from nonqualified deferred compensation plans subject to the provisions of Section 409A. n. Boxes 16 through 18 are for reporting state information. Step 3: Submit Copy B to the Contractor no later than January 31, 2019. Step 4: Complete IRS form 1096 Transmittal form for each type of 1099 form you file. For a sample IRS form 1096, see https://www.irs.gov/pub/irs-pdf/f1096.pdf. 1099-MISC forms must be filed by January 31 each year if you are reporting nonemployee compensation in Box 7. Otherwise, forms filed on paper are due February 28th, or if filing electronically, by April 2nd. Before filing, be sure that there are no amounts typed in an incorrect box, no zeros are to be typed in boxes unless required to correct an error, no strikeovers, and no use of punctuation other than decimal points. Do not staple or tape the forms together. The telephone number of the 1099 provider must be included in the name and address section of most 1099 forms. This number must provide direct access to someone who can answer questions about the statement. The telephone number is not required on Copy A of the forms, which is filed with the IRS. Do not fold the forms when mailing. If filing 250 or more of any one type of form, you are required to file your forms electronically. 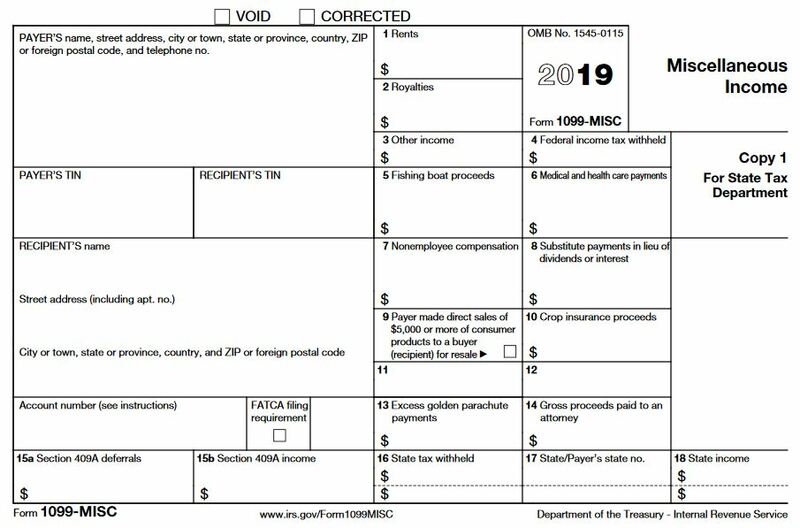 If you are not required to submit forms 1096 and 1099-MISC electronically and you are mailing these forms, see "Where to File" on form 1096. Pennsylvania requires a copy of the 1099-MISC form. A business that has an e‑TIDES account can submit the form electronically and is required to do so if filing 250 or more forms. If a company is not registered to file in e-TIDES, a paper copy must be mailed. If applicable, 1099-MISC forms should be mailed to the PA Department of Revenue, PO Box 280412, Harrisburg, PA 17128-0412. This information is general in nature and is not intended to be, nor should it be, treated as tax advice. For more information and assistance with 1099s, contact us!